Protesters are unhappy about recent calls in Poland to recognize the Volyn tragedy as an act of genocide. 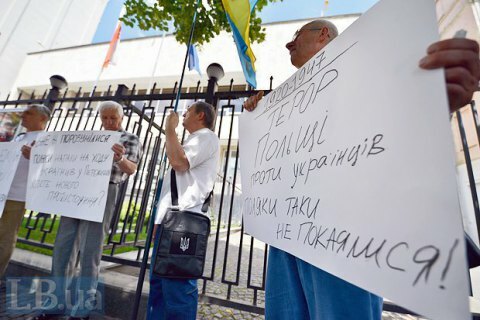 Protesters against the Polish Sejm's recognition of the Volyn tragedy as an act of genocide against Poles held a rally outside Poland's embassy in Kyiv on 11 July. According to an LB.ua correspondent, several dozen people called on Poland not to disrupt the historical reconciliation of the two nations. "The upper house of the Polish parliament supported the recognition of Ukrainians' defence in Volyn in 1943 against Polish occupiers as an act of genocide. For the first time in the history, the occupiers decided to be called victims. The League of Nations in 1921 recognized Poland as the occupier of Halychyna and Volyna. Ukrainians stand for reconciliation with Poles. However Ukrainians should not apologize to the occupiers. For the occupation, mass murders, ruining of Orthodox cathedrals and raped Ukrainian weddings. If Poland wants to stop reconciliation, we will not continue it unilaterally," the rally's organizers said. They also demanded that the Ukrainian parliament pass a bill recognizing the actions of II Rzeczpospolita as genocide against Ukrainians. The Ukrainian parliament is preparing a resolution in response to the Polish Senate's resolution which says Poland should mark 11 July as the national day of remembrance of victims of the "genocide committed by Ukrainian nationalists against citizens of II Rzeczpospolita".